This tutorial covers the array in data structure. 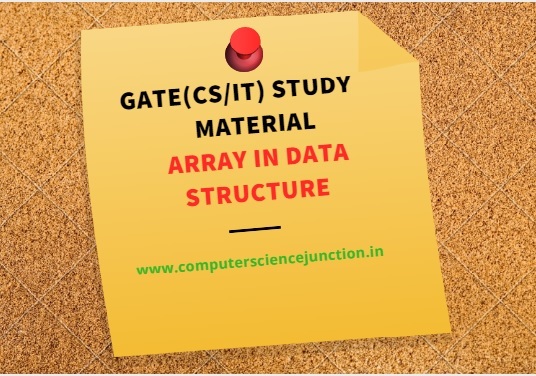 Array definition, array in c and different concepts of array in programming such as array declaration, types of array in data structure, two dimensional array, one dimensional array , sparse matrix etc are explained in this tutorial. Array in data structure is collection of items having same data type stored which are stored in contagious memory allocation. During array definition we should also keep in mind that array in data structure is a user define data type. Array in programming is a best data structure. a) Most assembly language have concept of array. b) From an array any other data structure we can be built. Why do we need array? random location is very tough to retrieve that’s why we need data structure. Where 1000, 1002 and 1004 are the addresses where these variable are stored. Array is used to sort the elements. Array can be used to perform the matrix operations. Array is used to implement the cpu scheduling. Array can be used in recursive function. There are following properties of an array. Each element is to the same size. Element are stored contagious, with the first element stored at the smallest memory address. Starting address of array is called base address. By default array is start from 0 and the element number is an address. Byte Addressing: if each byte has a unique address, we have byte addressing. Word Addressing: if each word is given unique address, but the byte within a single word cannot be distinguished. In general array may be of following types of array in data structure. 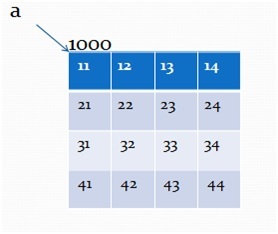 Some other types of array in data structure are Tridiagonal matrix array, Z matrix array and Toeplitz matrix array. Consider the matrix as shown in following figure. What is two dimensional array? 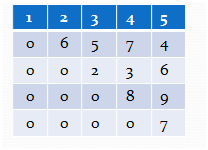 A two dimensional array in data structure is an array which is stored in the form of the row-column matrix, where the first index indicate the row and second index indicates the column. The second or the rightmost index of an array changes very fast as compared to first or left-most index while accessing the elements of an array. Example - int a   . This declaration represents an array which consist of 4 rows and 4 column. So the location of a32 in 2-d array,RMO form is 1018. So that the location of a34 in 2-d array, CMO form is 1028. What is Sparse Matrix ? Sparse matrix is a matrix which has most of the its elements of as 0 value, then it is called a sparse matrix. Why to use Sparse Matrix instead of simple matrix ? Storage: There are lesser non-zero elements than zeros and thus lesser memory can be used to store only those elements. Computing time:Computing time can be saved by logically designing a data structure traversing only non-zero elements. The dimension of an array is determined the moment the array is created, and cannot be changed later on. An array is a static data structure. After declaring an array it is impossible to change its size. thus sometime memory spaces are misused. 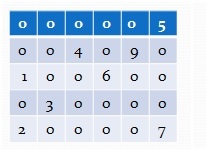 Each element of array are of same data type as well as same size.we can not work with elements of different data type. In an array the task of insertion and deletion is not easy because the elements are stored in contiguous memory location. Array is a static data structure thus the number of elements can be stored in it are somehow fixed.